After four months of development, the amaroK team has finished the new stable release of the popular KDE based audio player. amaroK 'Airborne' introduces the highly anticipated Wikipedia lookup feature. The cooperation between KDE and the Wikipedia project has already been the topic of an earlier article. amaroK is one of the first applications to integrate live information from the free encyclopedia, providing useful facts about the music you are currently listening to. Discography of an artist, biography and even photos are just a mouseclick away with the new Wikipedia tab. Another major new feature is the integrated Podcast support. Podcasts are Internet radio shows; amaroK can play them live from the Internet, or download to your harddisk to enjoy them later. The new Dynamic Mode automatically updates your playlist on the fly, adding music based on criteria you choose. You can start with a small playlist, and let amaroK generate a fresh stream of music infinitely. New tracks will be added randomly, from selected playlists, or based on suggestions from last.fm. This allows you to rediscover your music-collection in a completely new way. Everyone loves eye candy, so we made these pretty screenshots, showing amaroK 1.3 in action. Wikipedia artist lookup, a revolutionary feature providing information from the free online encyclopedia. Redesigned sidebar, with improved look-and-feel. Automatic download of scripts and themes with KNewStuff. Helix engine. Using code from the GPL Helix Player, it allows amaroK to play using the codecs of Real Player or Helix Player. New Playlist Browser, powerful and easy to use. Much extended DCOP scripting interface. Multiple analyzer visualizations for the playlist window. Podcast support, including live streaming and download capability. Crossfading for the xine audio backend. As during the 1.2.x release cycle, you should expect new 1.3.x releases at the beginning of the week every two weeks. amaroK has a history of being punctual in its releases. There will probably be a few minor releases. These releases will have cleanups and bug fixes thanks to Users Like You writing useful bug reports, as well as minor (meaning, non-refactoring) feature enhancements. After 1.3.x development is over, we will begin working on amaroK 1.4. From here plans become more tentative. One idea is to have amaroK 2.0's release be simultaneous as KDE 4.0, as we are looking forward to taking advantage of the new technology made available by Qt 4.0 and the potential of KDE 4.0 as soon as possible. Stay tuned for the upcoming amaroK 1.3 Live-CD, soon to be released on amaroklive.com. Where is the dynamic playlist? Is the Quemanager  what you call dynamic palylist? What kind of playlist is in the main window? Re: Where is the dynamic playlist? Excellent, your URL does nice things to the formatting. Could an editor delete this URL, please? has there EVER been a truly stable Amarok release??? Works perfectly on my Gentoo box. Maybe you should try a more mature distro? Yes, blame the guy's distro, why doncha. Actually, amaroK was unstable as all hell at version 1.2.3 on my (Gentoo) box, as well. 1.3 seems to be doing fantastically well, however. Using the xine backend, for reference. I'd also like to say that I have heard of people complain about amarok instability and I think it really comes down to the engine/configuration you use. I use amarok on gentoo and it's the best player I have ever used. 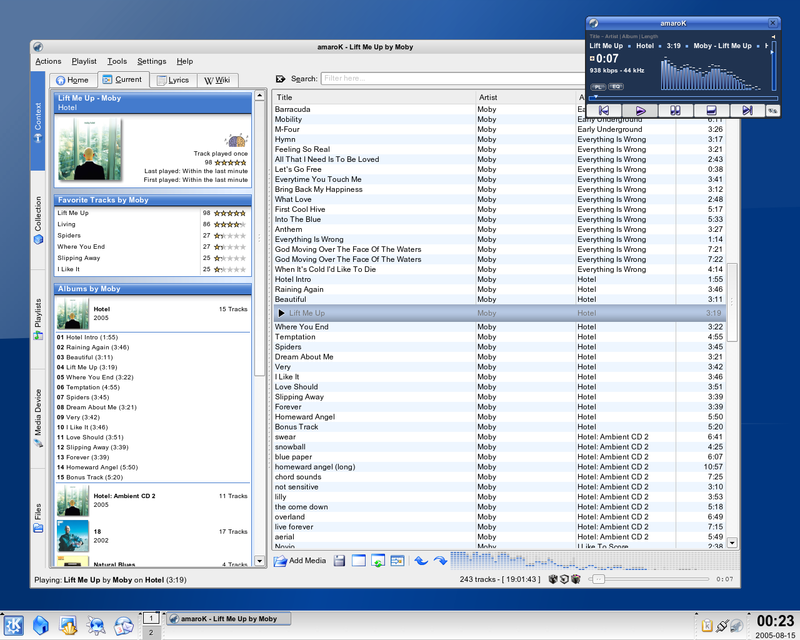 It makes winamp look like a slow POS and that is GREAT. I don't think the person was flaming by saying that gentoo does things in such a way that it avoids many problems that your binary based distro does. Xine is the engine to use with amaroK. aRts crashes after one song on my distribution- SuSE 9.3, certainly a "mature" distribution. Well, thanks, but I completely disagree. the xine engine won't even COMPILE here...So, I use the gstreamer output. Works fine. >> has there EVER been a truly stable Amarok release??? Not as far as I know. I have also been experiencing frequent crashes ever since 1.2.0 (currently using 1.3.0). I can only hope that the automatic trace e-mails end up solving these issues. Does Juk (or fill-in-your-soundapp) also crash? arts is not that stable, and may cause these apps to crash. Ditto for GStreamer. Haven't had any crashes since I switched to Xine. Not stability related, but they do confuse the heck out of our users by having musicbrainz enabled without MP3 support. I'd rather they would just remove musicbrainz altogether rather then distribute a shoddy version of it. And if Juk(or fill-in-your-soundapp) don't crash perhaps you are using amaroK with one of the other backends? The Xine backend and gstreamer are not that stable, and may cause amaroK to crash. > The Xine backend and gstreamer are not that stable, and may cause amaroK to crash. Now that's funny. No matter what backend I choose, it's always unstable and may cause amaroK to crash? Maybe the amaroK devs should put a big fat warning on the splash screen about that. No, if you choose an unstable backend it may cause amaroK to crash. Rather reasonable isn't it. Myself, I have never had any problems with aRts, on all the official versions I have used. Except some occasions with SVN/CVS and alpha or beta versions and long ago with some but not all versions of 2.0.x and 2.1.x. So I can't say why people constantly complain about it. On the other hand, I currently have a setup making the Xine backend crash and burn rather fast(Since I don't use it I don't bother to fix it or upgrade). And the few times I have bothered to try Gstreamer I have been far from impressed about it's stability.
" No, if you choose an unstable backend it may cause amaroK to crash. Rather reasonable isn't it. " What's reasonable is them not including a backend IF IT'S UNSTABLE. Don't be a wanker, wanker. Man, I must say, your comments are always so constructive. This is a problem with the Ubuntu kernels (which Kubuntu shares). I finally fixed the same problem after finding the answer on Ubuntu forums. Wherever you configure boot options (grub: /boot/grub/menu.lst: # nonaltoptions= ; lilo: /etc/lilo.conf?? ), add the kernel boot parameter 'noinotify'. The problem is with the interaction between inotify and amaroK. Yeah, but inotify is essential for having nautilus play nicely with the things happening to the filesytem elsewhere - and probably lots of other stuff... turning off inotify is stoopid, amorok should be fixed!! nautilus depends on a feature that isn't even part of a vanilla linux kernel release? Are you sure that you don't mix things up with dnotify or fam? Inodify will included in2.6.13 (currently it is a part of the rc's). I know what fam does, and I have heard of inotify. What is the difference between the two? Both monitor the filesystem for changes, but what differences do they have? Well, that doesn't answer my question. That article talks about inotify and dnotify. My question was "what's the difference between fam and inotify?". nd to continue: what about fam and dnotify? there seems to be three tools for monitorin filesystems: inotify, dnotify and fam. How do those relate to each other and what are their differences? So you are learn resistant. "File alteration monitoring techniques under Linux"
Which explains fam and dnotify. I guess we now got it, right? Strange, I have googled for it in the past, but I didn't come across any sites that really explained it. Sure, there were sites about fam, about inotify and about dnotify, but no sites that really talked about the differences between them. Anyway, that site seems like it's something I have been looking for. Thanks! amaroK doesn't do anything with inotify et all directly. It uses KDE methods for watching directories (which might in turn depend on inotify). im using 1.3 in kubuntu with gstreamer and it hasnt crashed yet. amarok was only unstable for me at 1.1 and below. once it hit 1.2.x, it very very rarely crashes. I used until I found yammi. thanks to the developers. and this would be a less cluttered UI than amarok's one? are you serious? I just downloaded and installed yammi, and I am astounding that anyone could say the ui is less cluttered than amaroK. Yammi has a few interesting features that amaroK lacks, like removeable media support and preview mode, but less cluttered and more simple and efficient? What are you smoking? For preview try the Intro-play script for Amarok. Yammi is new to me. However I think that between amaroK and JuK most people's music playing styles are accommodated. Dunno, I spose a lot of people running a non-English desktop would still prefer to use the English Wikipedia, since it's much more complete. So I'd rather make it so that you can switch the language in the app. AmaroK never stops suprise me! This is the first player that I find it joy to use. The music database is fast (I have ~ 25K songs in my), the wikipedia integration is sweet, the program is stable, fast and good looking. Kudos to all the amaroK developers! Yea, amaroK isn't intended to have thousands of items in the playlist. This situation will improve with amaroK 2.0. Is a decision regarding the release schedule of Amarok already made? Will there be an Amarok 1.4 or are you guys starting with 2.0? Will that include a Qt4 port? Seems like i'm living in a different world! My collection exceeds 13K, and the filter is the fastest query i've ever seen since a long time! BTW this is the feature that incourages me to use amarok! I reverted to 1.2.4 for the time being, because suddenly amarok started to name each playing track from a m3u file "Radiostream" and it did not use the title embedded in the m3u file anymore (when trying to play the m3u's on my own site: www.wilbertberendsen.nl/audio). Yeah, I'm looking into this. It's a regression I caused when I fixed the Metadata-History thingie for xine.